This page describes an extension of MMIX that has an integrated black and white Video display. Last update: Nov. 16, 2000: slight performance improvement. 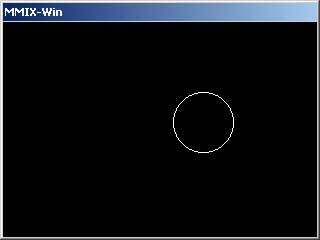 This program works only on Win32 systems. My implementation has been compiled with the cygwin environment. MMIX-Memory starting from address #5000000000000000 is devoted to Video RAM which gets mapped to a separate window with320*240 Pixels during simulation. Origin is in the upper left corner as usual and the y-axis is oriented downwards. Memory is mapped to the display in big-endian format, i. e. the least significant bit of the byte (or Octa) at address #5000000000000000 appears at coordinate (0,0). Consecutive Octas are mapped to the display line by line. To draw the pixel at coordinate (x, y), the bit at position x mod 8 of byte y*40 + x div 8 has to be set to one. The simulation is quite slow, since the complete video-memory is mapped after each write-access to it. However, I'm glad for any suggetions for improvement.